January 14, 2015 Robert A. Weigand, Ph.D. 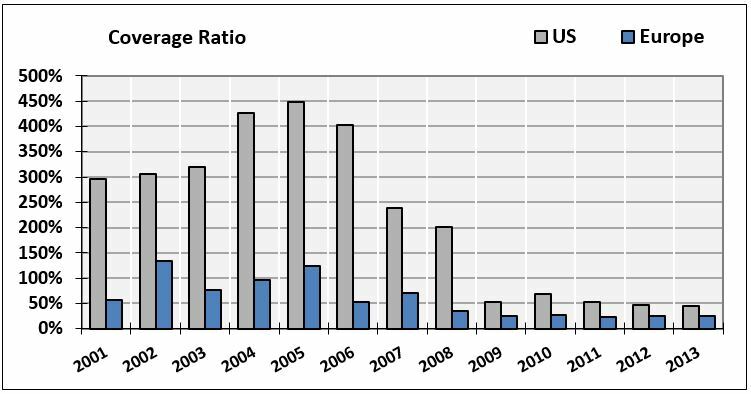 Taking a longer-term view, I find that U.S. banks earned significantly larger stock returns than their European counterparts in the post-crisis years, accompanied by higher rates of revenue and loan growth, lower risk, and superior profitability and loan quality. European banks, on the other hand, remain trapped in a downward spiral of negative revenue and loan growth, decreasing profitability, increasing impaired and nonperforming loans, and are sporting market value to debt ratios that suggest imminent insolvency. Following are my findings about revenue growth and loan portfolio quality. The next article will cover profitability, capital ratios, interest on deposits and payouts to shareholders. Let’s start with stock returns since April 2009, shown in the graph below. 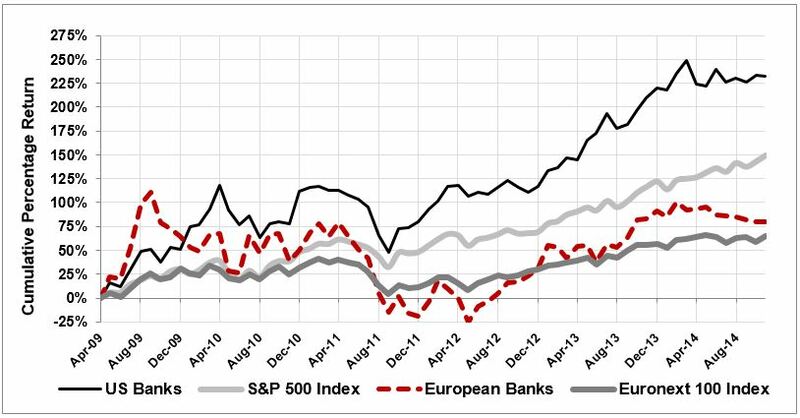 We know that both corporate profit growth and key macro drivers have been far stronger in the U.S. post-crisis, thus we see the S&P 500 (+150%) outperforming the Euronext 100 (+65%), and the average returns of the U.S. banks (+232%) significantly higher than their European counterparts (+80%). 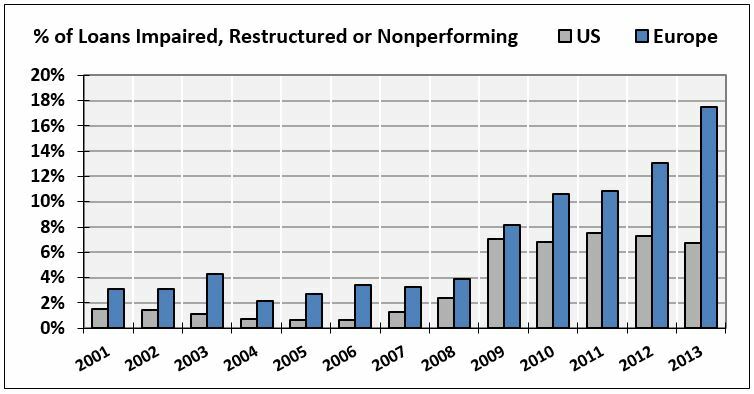 Both sets of banks have had difficulty growing their total revenue post-crisis, as shown in the graph below. 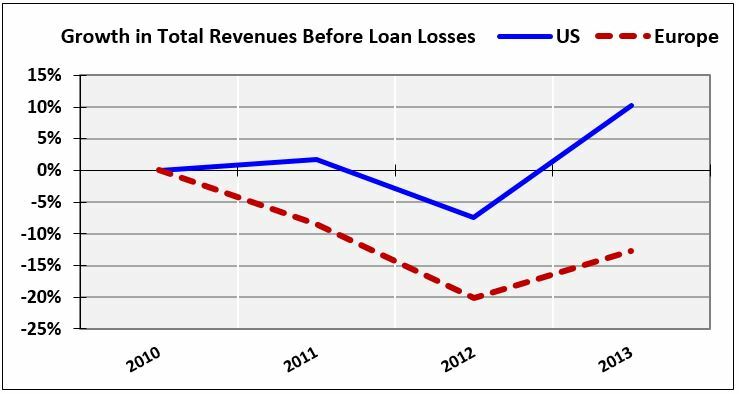 The next graph shows banks’ coverage ratios, which is the amount of “loan loss allowances” relative to impaired loans that banks set aside on their balance sheet in the event of outright loan defaults. After a loan default, allowances are reduced and transferred to the income statement and expensed against bank revenues (as “provisions for loan losses”). In our new centrally-planned world, banks have adopted a “What, me worry?” attitude about their troubled loans. Despite higher levels of impaired loans, both U.S. and European banks are setting aside much lower relative allowances for loan losses. 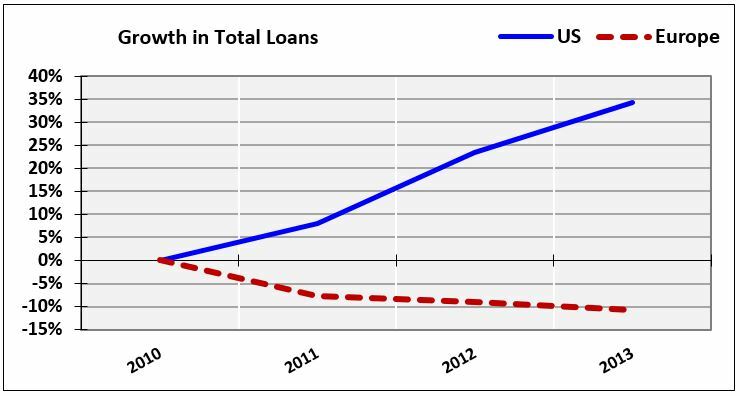 Here we see the effect of a zero interest rate policy (ZIRP) — why declare a loan as “nonperforming” when it can be rolled over again and again at a short-term interest rate that is essentially zero? What could go wrong? Next installment will cover banks’ profitability, capital ratios, interest paid on deposits and payouts to shareholders. Data provided by S&P’s Capital IQ.